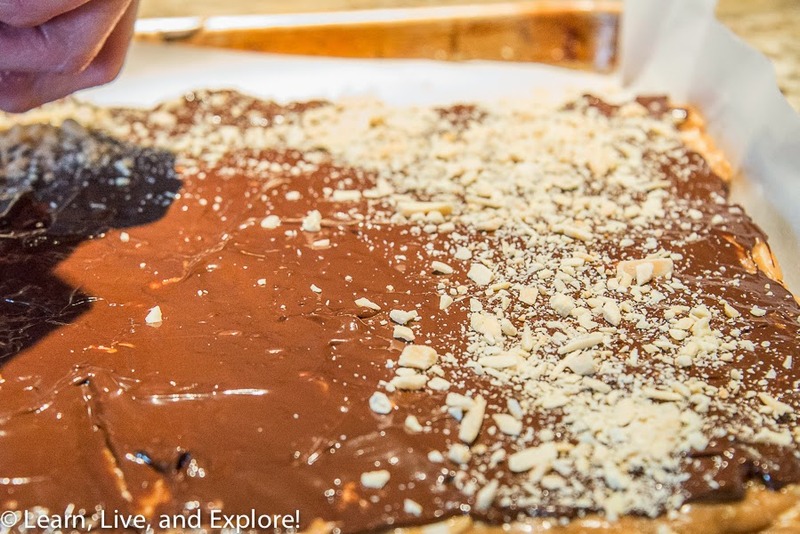 Chocolate Almond Toffee ~ Learn, Live, and Explore! As we head into the holiday season, here is a perfect gift to give to coworkers, friends, neighbors, and family. 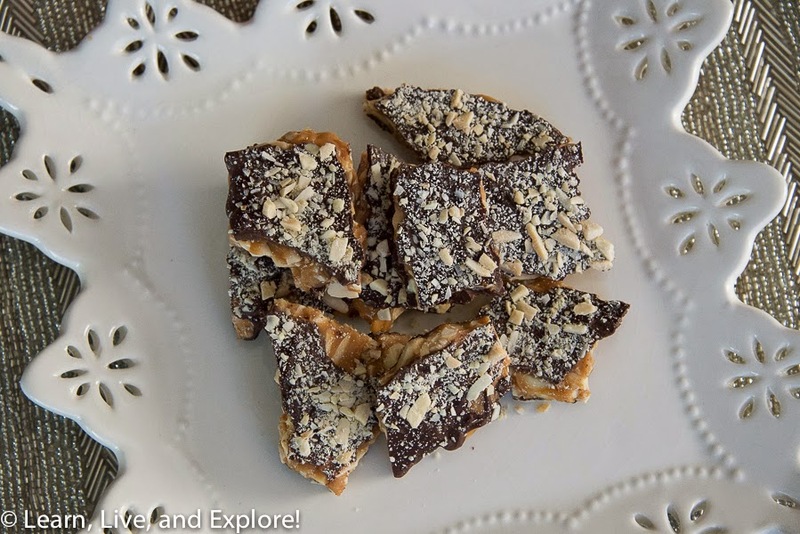 These chocolate almond toffee pieces are a family tradition in my house, and though they take a fair amount of time to prepare, the recipe can be repeated (not doubled) to yield more and the toffee can be frozen for future gifting. The key to success with this recipe is using good ingredients - good butter and good chocolate! Since the steps are all important, I've added some photos to better explain the process. 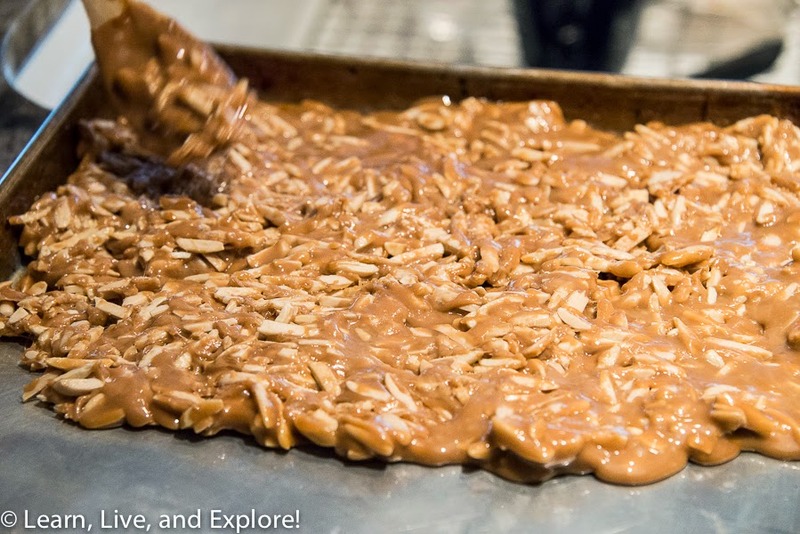 These ingredients will yield half of a baking sheet of toffee. If you want more, you will need to repeat the recipe. A half sheet will get you at least 4 gift bags of toffee. 1. Toast the almonds on a baking sheet covered in parchment paper for 10 minutes at 375 degrees. 2. 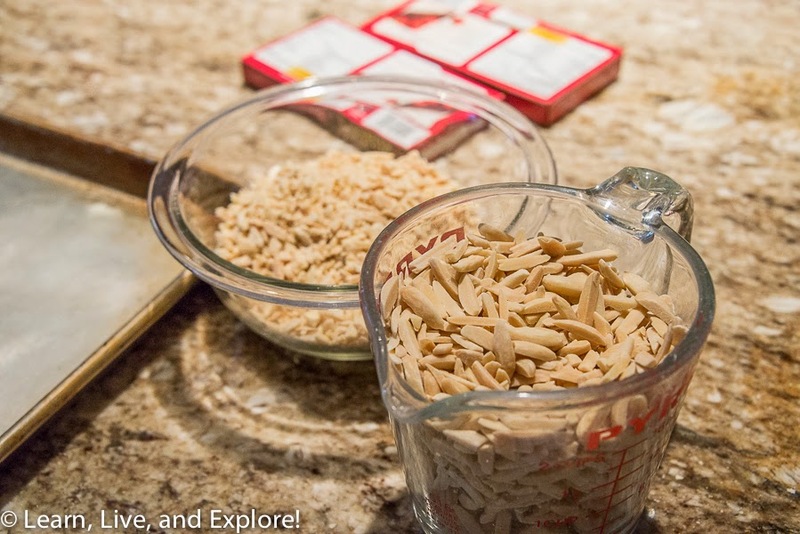 When cool, take 2 cups of the almonds and coarsely chop them (if you bought the slivered bag of almonds, you can choose to leave them that size or halve them). 3. Finely chop the remaining 3/4 cup of toasted almonds by hand or with a food processor, and set aside for after the chocolate step. 4. Butter a jellyroll baking sheet and set aside. 5. In a saucepan, combine the 1 cup butter, sugar, light corn syrup, and water. Bring to a boil, then reduce heat to medium. 6. 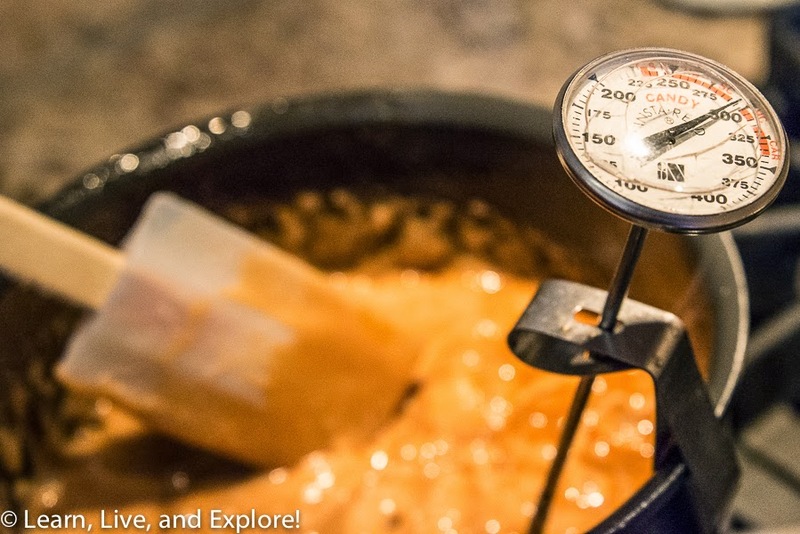 Using a candy thermometer on the side of the saucepan, continually stir the mixture until the liquid reaches 300 degrees. This is going to take at least 15-20 minutes, so be prepared! You must get the liquid to this temperature because that is a "hard crack" state, and anything less will be a "soft crack" state and too chewy. 7. 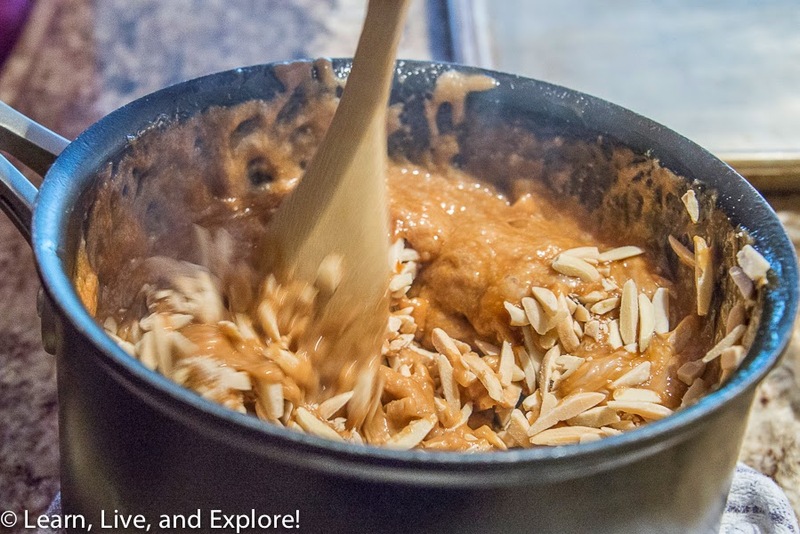 When the mixture reaches 300 degrees, remove from the heat immediately to a heatproof surface and quickly stir in the 2 cups of coarsely chopped almonds. The toffee hardens fast, so you need to get through the next step while it is still pliable. 8. Pour the toffee onto the buttered jellyroll sheet, and spread until it covers half of the sheet. It should be at least 1/4" thick. 9. Let the toffee cool at room temperature for over an hour. 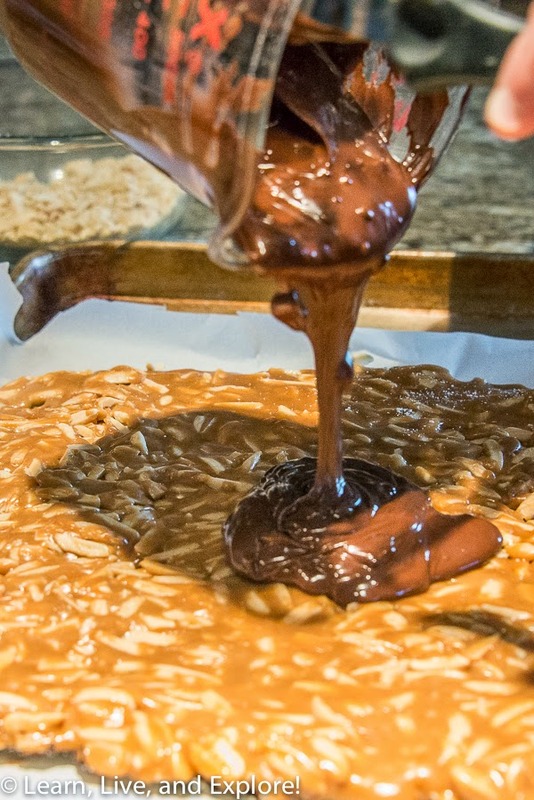 When the toffee is cool to the touch, gently lift it up off the sheet and transfer it to a piece of parchment paper, which can then be placed back onto the baking sheet. 10. Carefully melt half of the chocolate (5 oz.) in a glass dish in the microwave, then immediately spread on one side of the toffee. 11. Sprinkle the finely chopped nuts on the chocolate while it is still hot. 12. Let the chocolate set on the one side for at least 30 minutes at room temperature, then refrigerate for another 30 minutes. 13. When the chocolate is hard, flip the toffee over and repeat Steps 10-12 except leave it in the refrigerator at least an hour to set. 14. After the completed toffee has been thoroughly chilled, bring it out of the refrigerator and break it with your hands into pieces about 1 1/2 to 2 inches big. There is no perfect way to break this toffee, so just have fun and sneak a few of the tiny pieces that don't make the cut into your mouth. Yum! 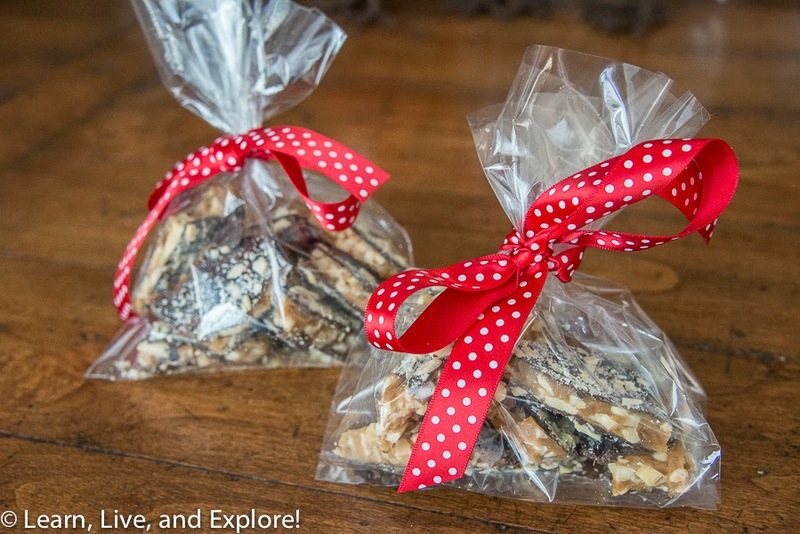 For gifts, wrap 8-10 toffee pieces in a cellophane bag and tie with a festive ribbon.